England's Jodi Ewart Shadoff has fallen four shots behind leader Jenny Shin after the second round of the Kia Classic in California. Ewart Shadoff, from Northallerton, had shared the first-round lead on Friday after an opening 67 at Carlsbad's Aviara Golf Club. But the 28-year-old shot 71 on Friday, as South Korea's Shin carded a seven-under-par 65 to go clear on 10 under. New Zealand's world number one Lydia Ko is one shot back in second place. England's Holly Clyburn is tied for 14th on four under with compatriot Charley Hull on one under alongside Scotland's Catriona Matthew. 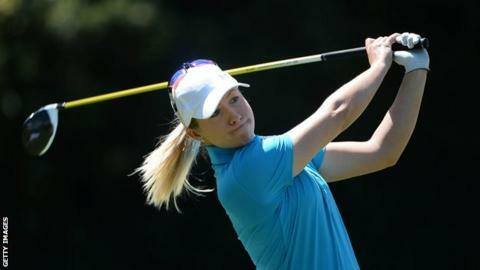 Felicity Johnson, of England, finished on level par and made the cut despite a double bogey on the 10th, but compatriot Laura Davies did not make the third round.